Maxol has you, our customers, at the heart of its business. We want to provide the best possible customer experience so we are delighted to announce that we have partnered with TruRating to launch a new way for you to give us in-store feedback at the time of your visit. TruRating is a really quick, anonymous and simple way for you to let us know how we’re doing. Just before you’re about to pay, a single question will pop up on the payment terminal asking you about an aspect of your experience. You might be asked to rate us on our product range, for example, or the quality of the service you received. It will only ever be one question, and all you have to do is press a single number on the keypad to give a rating from 0 to 9. It is completely anonymous so you can tell us how you really feel at the time and If you don’t want to rate, no problem, you can always just skip – but we hope you won’t! 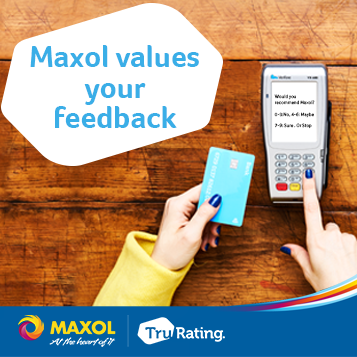 Right now, TruRating is live in the following Maxol Service Stations, Adamstown, Donabate, Dublin Rd Dundalk, Maynooth, Long Mile Road & Ardbrae Vevay Road, with a full roll out nationally this summer. We will use this to continually improve our customer service, in turn making your experience better, so on that note we invite you to give us your TruRating next time you are in-store.